In the hands of Mrs. Me, I’m afraid. Obviously along the way there may be a few drinks involved, a couple of glasses of wine, a couple of glasses of whiskey and of course coffee / tea and yes, even water. And this, along with occasional biscuit, cake, crisps etc. does me quite adequately for any day of the week. So why is it that as soon as I and, I suspect many other people, board a cruise ship, we throw caution to the wind; discard common sense ignore what one’s body is saying and devour anything on offer. Porridge (maybe), fried eggs, bacon, sausage(s), beans, tomatoes, mushrooms, fried bread, and [sometimes] black pudding, followed by toast and jam and a plate of fruit. Desert) whatever is on offer but normally includes cream / custard or, if I’m feeling a little too plump by this time of day, a sorbet. All accompanied by wine and liqueurs. After Dinner Retire to see a show or listen to a band to enjoy a couple of glasses of wine / champagne / prosecco / and/or whiskey. Obviously along the way there may be a few drinks involved, a couple of glasses of wine, a couple of glasses of whiskey and of course coffee / tea and yes, even water, but, no occasional biscuit, cake, crisps etc. I’m not a pig you know. I have to admit, I did have a theory (see My Last Posting of the Cruise) that ‘one of the peculiarities of cruising, especially sea cruising is that the salt-water air has a tendency to reduce the elasticity of one’s clothing thus making them appear and feel so much tighter. I can think of no other explanation, save that of course of over eating, which I find hard to believe.’ – And to add insult to injury, even my feet need bigger shoes when I go cruising: How on earth does that happen? And so, it’s back to MyFitnessPal. – just look for Podgethepuffer. Must lose weight, must lose weight. Sitting on the balcony at 07:30 this morning, with the temperature hovering around 75f, in my shorts and (coffee stained) t-shirt (I got a thick ear for the t-shirt) I was mesmerized by the sight of so many flying fish as we sailed across the Atlantic off the coast of Guyana towards Trinidad. I wondered why these creatures take to the air when the natural habitat is in the sea. I assumed they were all trying to get away from predators but came to the conclusion that as the fish were doing this for so long, the predator must have been the Adonia (our cruise ship). I watched them as they came out of the sea and ‘flew’ across the tops of waves before once more returning to their natural element. I watched them as they came out singly; I watched them as they came out in large groups (as shoal becomes flock becomes shoal). I watched them as they covered amazing distances rising and falling above the rolling seas; I watched them as they ‘flew’ and even changed directions. I watched them for an hour, maybe longer. Then Mrs Me arose from her pit (bed), breaking my peace and solitude and demanded her morning tea: “Right away My Duchess” was my response as I scurried away to tend to my husbandly duties leaving the flying fish to their strange existence. The phrase Drive By is an often used / heard phrase though normally related to bad deeds. Well on the Adonia we were treated to a ‘Cruise By’ of Devils Island – home to the perpetrators of bad deeds: Devils Island was previously used as a French Penal Colony (until 1953) for really naughty people (murderers, political embarrassment, constant escapees, etc.). The islands, there’s three altogether, look like idyllic tropical islands but I doubt the naughty people shared the same thoughts. I so desperately wanted to get onto these islands but the sea state was such that a ‘Cruise By’ was all we would be able manage. As we approached the islands on our starboard side (that’s on the right for normal people) and just about every passenger clamored for the best spot from which to take photos. You’re truly was stuck at the back, temporarily, but, under the authoritative direction of Mrs. Me, I did manage to worm my way forward. But then, my sea going skills, possibly just guesswork, worked out that the boat would not be able to carry on right round the islands and that she would have to turn around and come back with the Islands to Port (on the left) and with this new found knowledge I instructed (I know, I was taking my life into my own hands here), but yes, ‘I instructed’ Mrs. Me to accompany me back the cabin: “not at this time of the day she said”. “No” I said, and then I explained that from our balcony we would have grandstand seats from which to view the islands. Finally she agreed but only after the promise of a large gin & tonic with ice and lemon. From there I was able to take some amazing photos, all of which are securely trapped in my nice shiny new camera with no means to transferring them to my laptop. Why? Because the adapter I brought had been damaged; through my own ineptness I had managed to bend half the pins rendering it useless. So the pictures will have to wait. 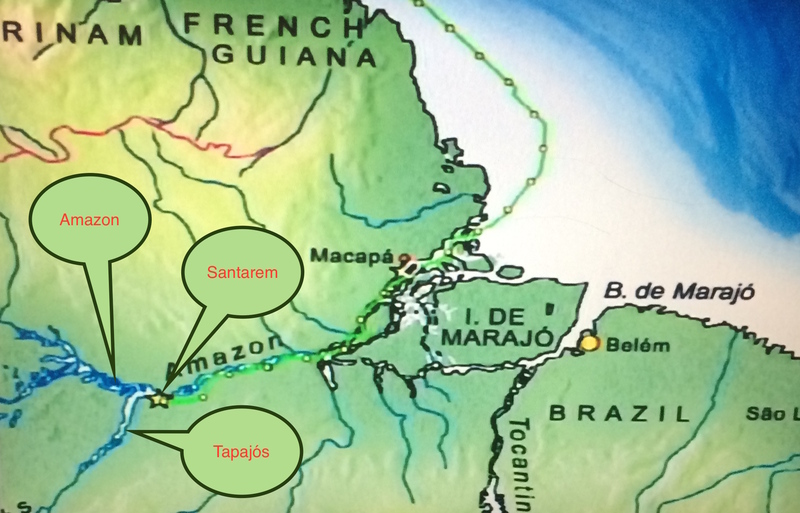 Visiting the Amazon was to be the highlight of our trip consisting of two days sailing along the mighty Amazon River and a day spent ashore at in the town of Santarem, located as it is, on the Tapajós River. Our first port of call, which was actually a 2-hour stop in the middle of the river, was at Macapa: This was to allow immigration officials and river pilots to join us, for the duration, to help navigate the river – sounds to me like a cool 3-day jolly if you ask me. Once on board, we set off and through the course of the first day, the Amazon unveiled its beauty for all to see: we passed isolated dwellings, little more than huts; sometimes built on stilts to lift them above the flood level, where the inhabitants would wave at us or even try to chase us in their little, woefully underpowered, boats. I have no idea whet would have done if they’d caught up with us (perhaps they were pirate scouts), but they never did, though it was quite amusing to watch them bob about somewhat precariously in the wake of our ship :-). The ‘Meeting of the Waters’ is an anomaly where the muddy brown waters of the Amazon River and the brilliant blue waters of the Tapajós River meet but don’t actually mix for a couple of miles and as such the two waters can be seen side by side as you sail along. After this we went to a smaller tributary to view the wildlife, you know the sort, cows, sheep, chickens, water buffalo, iguanas, sloths, vultures, etc., etc. Oh, we also saw some more local dwellings on stilts. After a while we stopped and started fishing for Piranha. 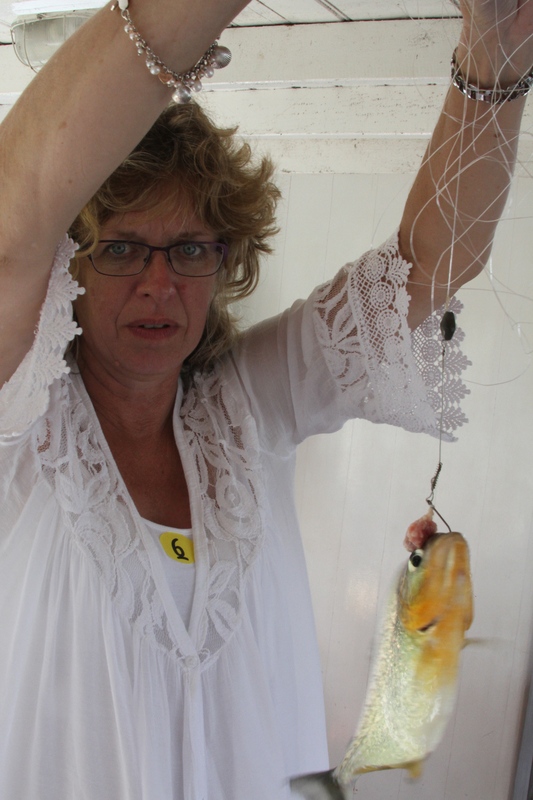 Mrs. Me took her place on the boat between my and another gentleman and inevitably, after the other gentleman and I had pre-baited [her] swim, Mrs. Me hooked a Piranha and, accompanied by all sorts of squeaks & squeals, she eventually brought the poor creature on board for us all to look at. I took photos, of course I did, but they are stuck on my big camera, so they will have to follow but be assured, despite me wanting get a picture of Mrs. Me kissing the Piranha, the fish was having none of it and stayed firmly with the hook and line; probably a wise choice as she would have probably have just eaten it. Next will be tales of Caibbean Islands, and Captains Gala Parties. and, hopefully, pictures from my camera.